On Tuesday, the current Council defeated a proposal for new rules for public meetings. It was an item left over from the previous Council. The "new rules" proposal was drafted by our previous Council to enforce "civility" at public meetings. Over the last couple of years, we have seen pleas for civility used by the Friends and their friends as a weapon to limit public participation and openness. Ironically, those who have clamored the loudest for civility here have often behaved in the most objectively uncivil ways themselves ... for example, by resorting to name calling and out-and-out lying. First, they show that San Juan County is on the radar screen of some of the most influential people in the state. Second, they show the casual contempt that state officials have for anyone outside of the Friends, the tribes, or insider scientists. Third, they show no respect for the legitimate concerns of local people and display condescension at the premise that differences with the PSP might actually be authentic. Kongsgaard implies that CSA has somehow manufactured controversy and created dialogue that isn't "real." In fact, Kongsgaard shows off her political blinders by denigrating the "world view" politics of her opponents while she simultaneously displays nothing but her own "world view." Fourth, the emails employ tactics that we've come to expect in the San Juans -- paint all CSA-like troublemakers with a broad politically-charged brush (e.g., Tea Partiers); lie about them (CSA "screamed" at Ruckelshaus); favor tourists over residents; and generally vilify anyone who encourages broad-based local public participation. Lastly, the emails show the speed-dial first-name bonds that existed (and may still exist) between our local manipulative hardball world-view commissars and the state's manipulative hardball world-view commissars. The email from Kongsgaard is sickening for its prejudice. For reference and background, Martha Kongsgaard is the current head of the PSP Leadership Council. Ruckelshaus (formerly Head of the PSP Leadership Council) and O'Keefe (formerly Executive Director of the PSP) have moved on, but as most San Juan residents probably realize, Bill Ruckelshaus remains a hugely influential figure. And speaking of huge, he also owns one of the largest shoreline homes and docks in the county. The email string kicks off with Ruckelshaus forwarding the CSA newsletter to O'Keefe and Kongsgaard with the ominous admonition, "Trouble brewing in the San Juans." However, Ruckelshaus is wrong. Any fair evaluator of the evidence would conclude that trouble has already been baked into our state, local, and tribal governments ... garnished with the scientists and non-profits that are in league with them. Errata: The initial wording of this post incorrectly identified Gerry O'Keefe as being the former Head of the Department of Ecology when in reality he served as the Executive Director of the PSP. Corrections have been made and my thanks to the reader who pointed out the error. Thanks for this Bill. This is ongoing up there as you know. I think you have personally been screamed at there, no? The county has adopted the BAS already and this cannot be undone until the CAO is complete which will be sometime in June. Then the law suits will be filed by both sides. The best thing that can happen now is that a thorough record is made by groups like Friends of the San Juans, UW scientists, and the tribes so that they can prevail in court. It is a lousy system, but it’s the one we have. IN the mean time, it is rough to be Lovell Pratt, for example, who is chair and is trying to hold the line. The CSalliance is certainly whipping up fear and introducing new science into the CAO discussion and are managing to fill town halls with 50 – 70 people. At the end of the day, it has much more to do with philosophy than with science – see the Tea Party. If the case could be made publicly that their science is not on point, that over 50% of the shoreline is already built out and that the parcels are by and large under ½ acre, and that the economy of the San Juans depends on the 1,000,000+ tourists who travel there to be sold “beauty and wildness” and on and on, they would still hate government and resist regulation in most any form. They are jamming the planning department by encouraging land owners to go, one by one, to the planning department to ask what effect these regulations ‘could’ have on their land. They are demanding that the council notify all land owners of the same, with individual maps, etc., all under the request for transparency and open government. That plays well and is hard to combat. But it is killing the dept. who otherwise would be working on the CAO etc. and so the worm turns….. This e mail got me off my duff to call Lovell Pratt, the chair, and friends of the San Juans. They need our support to do the hard thing. We need to listen to the CSA, and the worries of the property owners and figure out how to get the hard work done. There is not a lot of real communications getting done. It is world view stuff that doesn’t allow for much dialogue in my experience. 4 4 0 8 B E A C H D R I V E S. W.
Trouble brewing in the San Juans. Images not displaying properly? Add info@commonsensealliance.net to your address book now. Guest Editorial: Why is Ocean Science Missing in the SJC's BAS? My wife and I came to San Juan Island in 2009 to enjoy the wonderful ambience of these Islands. Like many friends and neighbors, we are environmentally oriented--I having retired from 40 years of ocean technology work, and she a long career in public relations. We both are alarmed by San Juan County’s recent CAO developments and public disclosures--her from a public information perspective, and I from an ocean sciences point of view. We are not directly affected, but I want to speak out as a county taxpayer and home owner in the cause of clarity and transparency. Our fellow taxpayers and residents need the real facts to better judge the truth and value of this “environmentally necessitated” county initiative against the cost and economic risk to all our communities and their residents. Here’s the main issue: the current CAO is based on facts that do not apply to the San Juan Islands and missing the facts that do. My comments are directed toward the centerpiece of the CAO plan--Imposing deep setbacks and buffer zones to protect and restore our marine environment. There’s a big problem with the County’s approach. The County’s agencies have developed a long list of Puget Watershed and related reports, called “Best Available Science.” This BAS forms their justification for the CAO, and the SMP to follow. According to the State these ordinances must be based on some definition of best available science. With my long association with ocean institutes, including the Scripps Institution of Oceanography in La Jolla, CA, I tried to determine the basis of the “ocean truth” in this BAS. I was appalled to find that, despite years of Salish Sea studies, no physical oceanographic studies describing our local marine waters exist in this BAS. Without an ocean-reality baseline, how can this county legitimately proceed with a marine environmental remediation plan? And, how costly will this plan be to enforce if their “science” is missing essential information? 1. The San Juan Islands waters are not part of the Puget Sound at all – They are part of the Southern Straits of Georgia, almost 10 times larger in water volume, and in river outflows. We may be politically connected to the Puget, but our local marine waters are Canadian, and incidentally contain the effluent of 80% of the economic output of BC. 2. Mostly blocked from northerly exit, the massive outflows from BC’s Fraser and nearby rivers create a persistent southerly flow of their waters through our islands out into the Straits of Juan de Fuca. These river flows exceed 100 cubic kilometers of river water annually--about ten times that of all Puget rivers. 3. Because of seabed and tidal flow features just to the south of us, these northern waters don’t mix much with Puget waters during tidal cycles. This means there is little mixing of our Islands’ and Puget waters by our strong tidal cycles, further isolating us. These tides also create massive upwelling of clean Pacific waters along our shorelines from the bottom counter-current, and constantly bring fresh ocean waters to our shorelines. Our Islands’ shorelines have the best flushed marine waters of any coastline in the lower US, and no local marine water quality measurements can legitimately separate the origins of local and Canadian runoff. The ocean-truth for our Islands is that we are immersed in a huge BC system that mixes massive river outflows from the Fraser basin with Pacific Ocean waters. BC governments have been addressing water quality issues for decades and are making progress—but, we are only a small part of their very large system. We San Juan Islanders will be far better served by focusing on the few local area problems that we have and that we can do something about, rather than by incorrectly pursuing environmental actions that, to no avail impose laws based on incomplete information. It is time for the County of San Juan to step back and get the Ocean reality for our Islands right--before proceeding further with these CAO and SMP initiatives. Why Not Get Rid Of The Conservation District? There is a lot more to be said about the Conservation District. For example, in 2010, our County Council approved a parcel fee lasting 10 years (the maximum length of time allowable) of $5 for every property in the County to fund our Conservation District. Now, the Conservation district is asking for more. They want $5 per parcel plus 5 cents per acre. 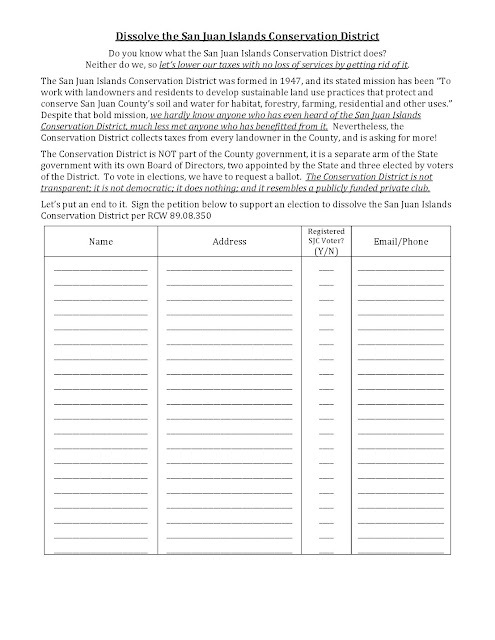 Commenters on the last post raised the possibility of gathering petition signatures to hold an election to dissolve the San Juan Islands Conservation District. We think that's a great idea, and a hearty "thank you" to the commenter who suggested it. 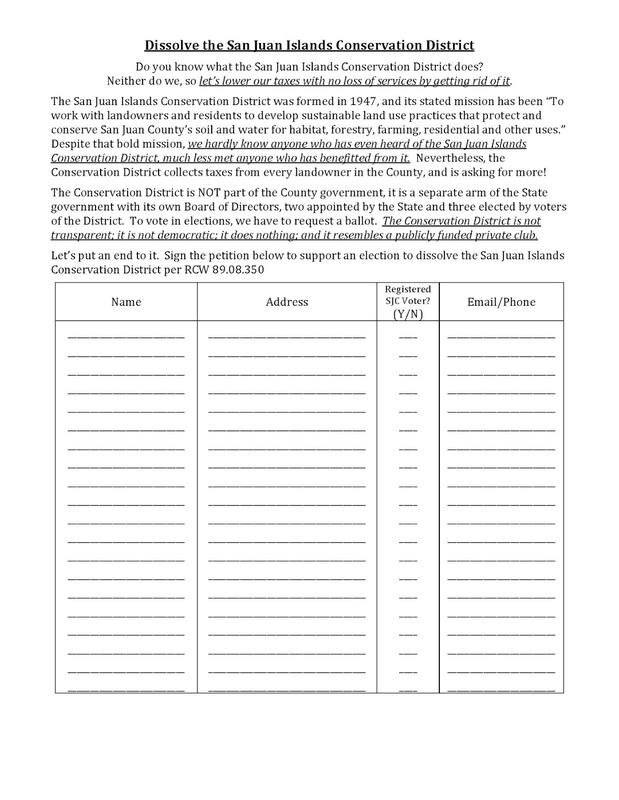 In response, we offer the following petition sheet for people to use to start gathering signatures. According to the election figures from last April, there are 11,952 voters in our county, and according to RCW 89.08.350, we need 20% of voters to force an election to decide the dissolution matter. Nothing ventured, nothing gained. Let's give it a try. We need approximately 2,400 petition signatures. The template below has 20 signatures per page, so we need 120 full pages. Right click to download and print. Yesterday afternoon at 1:02 pm the County Council discussed the possibility of moving grant funding for all or part of the PSP LIO/AAOG and AOC together with the MRC and Lead Entity to the CD. Make sense? This is why the average citizen has no hope of tracking County shenanigans. Even the jargon is an insider's game, and when you add in the artful half-truths and deception that are the hallmarks of our zombie-Friends staffers ... you get an impenetrable web of eco-deceit. If you watch the linked video, you will see that not even Jamie Stephens (our County Chair) can keep the acronyms and responsibilities straight. He struggles like grasshopper while Barbara Rosenkotter rattles off acronyms and committee names as if she were a shaolin priest of eco-bureaucracy. The Puget Sound Partnership (PSP), which is funded by the State and the Feds, is embodied on the local level by an organization created by our County Council, the Local Implementing Organization (LIO). What does it implement? It is supposed to implement the PSP's Action Agenda for San Juan County, which is the PSP's local plan for cleaning up our local waters. If you actually read the PSP's Action Agenda, you will note that they plan to clean up our local waters by having endless grant-funded coordinating meetings. The LIO is also known as the Action Agenda Oversight Group (AAOG), and so you often see the acronyms LIO and AAOG used interchangeably or written as "LIO/AAOG." Subordinate to the LIO/AAOG are two policy-making bodies: the Implementation Committee (which helps draft the County Action Agenda) and the Accountability Oversight Committee (AOC), which is a committee comprised of the County in league with the Tribes. Both the County and the Tribes have veto votes regarding policy initiatives associated with the AOC. Rosenkotter, Lyshall, and Zee hatched a plan to move this alphabet soup out of the County offices and into the enlarged quarters of the Conservation District (CD). In addition, they want to take with them the Lead Entity Coordinator role for salmon recovery (a watershed-oriented program funded by the State). Up until now, this whole shooting match has been jumbled together with the County's Marine Resources Committee (MRC). However, with greater scrutiny being placed on County Advisory Committees, especially the MRC, Rosenkotter, Lyshall, and Zee want to take the meat of the MRC's funding and "authority" and stash it in the Conservation District. We should care because these people are sneaky, because they are thinking several steps ahead of the rest of us, and because they have a pervasive influence on the lives of everyone who lives on our shorelines. For example, let's take a look at the Washington Department of Fish & Wildlife (WDFW) TACT grant to San Juan County for a moment. TACT stands for "Trouble shooting, Action planning, Course correction, and Tracking and monitoring." Via this grant, the MRC jumble was working in boats with the Friends and armed enforcement officers from the Department of Ecology to map possible shoreline violations. Even Pictometry got mixed up with the activities associated with this grant, since sources suggest that Amy Windrope (from WDFW), Stephanie Buffum (Friends), Rosenkotter, and Lyshall were eagerly anticipating the synergies that would accrue from having Pictometry support the TACT pre-enforcement mapping. The County Council didn't authorize this work, and when certain County staffers threatened to bring these activities to light, their jobs were threatened. These are the kinds of things that happen in our County now when we supposedly have control. What would it be like if these roles and responsibilities were to be splintered? Although the Conservation District is purportedly a non-regulatory body, the scheming that's going on right now is an effort to transform the Conservation District into grant central for facilitating enforcement actions against shoreline owners. The CD may not do the actual enforcement, but they figure they can support enforcement by others. Thankfully, at least in the discussion yesterday, Jarman and Hughes saw the ploy for what it was. Scandals here are de rigeur, and it remains to be seen whether the new Council and Manager can do anything to stop them. Planning CAO/SMP Debacle --Virtually this entire blog has been devoted to the CAO/SMP mess. Shireene Hale has been at the center of the ongoing CAO nightmare the entire time. No matter what the GMHB ruling, the Trojan Heron doesn't see much improvement happening to the CAO process unless Hale's involvement is summarily halted. Hale has demonstrated repeatedly that her primary interest, as a planner, is to stop everything. She has displayed outright contempt for public participation too. Colin Maycock is nominally in charge of the SMP, and while he's no Shireene Hale, he has been referred to by Stephanie Buffum as being "on our Team." That does not bode well. Public Works and Stormwater -- Speaking of Shireene Hale, her husband, Ed, is in charge of the County Stormwater Program. The County Stormwater Program has been an open sore for years. We could talk about the (non) applicability of the stormwater manual to our rural circumstances, or the murky logic behind the justification for our stormwater utility and fees, but the ire of many citizens is most easily aroused when discussion turns to the Eastsound Stormwater Facility (i.e., the Eastsound mosquito hatchery) or other Public Works stormwater projects ... all typically overbuilt, poorly designed, ugly, grant-funded, and largely useless. Ed Hale appears to have been the mastermind of all of it. Public Works Road Projects -- Nearly every new road construction project undertaken by the County in the last few years has been a treatise on mismanagement. For instance, the Lopez Fisherman Bay Road improvement project cost millions of dollars, was way over-budget, required the cutting down of beautiful old trees, necessitated hideous wetland mitigation (Lopez's version of the Eastsound mosquito hatchery), nearly doubled the width of the road ... and at the end of all of the "improving," the speed limit was lowered by ten miles per hour by vote of the County Council that authorized the expensive improvements in the first place. On Orcas right now, the Mt. Baker Road improvement project is a daily banquet of blunders ... almost severing a high voltage power line, having a road height two feet higher than planned as a result of using LiDAR instead of an actual survey, and having to undertake "unforeseen" wetland mitigation. When finished, Mt. Baker Road will look more like an airport runway than a country lane. And Mt. Baker Road is just a warm up for the Spring Point Bridge project on the west end of Orcas. Responsibility for this maddening empire-building seems to rest squarely on the shoulders of Rachel Dietzman, County Engineer. In the eyes of many, Dietzman is arrogant, incompetent, adversarial, and hell-bent on suburbanizing and highway-izing every charming country road in the county. She also has a penchant for cutting residents off from utility access. Dietzman, whose husband is also on the infamous Marine Resources Committee (MRC), is another one that has to go. Conservation District Power Play -- The goal of the Machine during the last election was to take over the County Council while Ron Zee consolidated power at the Conservation District, which is a separate district of State government. The elections didn't turn out as the Machine had planned, but Boss Zee has moved forward with transforming the Conservation District into the pubicly-funded Kaaba of the Friendly Machine, with all the grant corruption that goes along with it. Zee's idea is to take grants away from the County and funnel them through the Conservation District instead. Zee is moving forward with transferring responsibilities for the Salmon Lead Entity, the LIO/AAOG, the Marine Resources Committee, and parts of the Agricultural Resources Committee. Already, the Conservation District has moved into new larger digs, hired Linda Lyshall, designated an office for Barbara Rosenkotter, raised the specter of appointing Kyle Loring as an associate (unelected) Board member, and made big plans for itself ... unilaterally ... without informing the County that it's taking money, programs, and people away from them. And there are other scandals, such as staff who lie to Council ... unmitigated conflicts of interest ... and threats of retaliation to employees who attempt to make things better. We'll be elaborating on each of these areas in the coming days. As many of our readers know, our Critical Areas Ordinances (CAOs) were appealed by several parties to the Growth Management Hearings Board (GMBH). Hearings were conducted here during the week of June 24. Below is a video link to the summary comments of Sandy Mackie, the attorney representing the Common Sense Alliance (CSA). The GMHB is expected to announce their decision on September 6.